Mexican weddings are unlike any wedding I’ve ever attended in the United States. 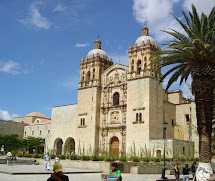 From the religious ceremony to the fiesta, it’s a celebration that is rich in traditions. Recently, I had the privilege to join a sweet friend as she celebrated her wedding day in Mexico City. Usually, there are actually two weddings in Mexico. The first ceremony is a civil ceremony, commonly held a week or several days before the religious ceremony. A judge presides over the civil ceremony that can be held at someone’s home or in a restaurant or other special setting. My civil ceremony took place at my house in Mexico and we had a party for 100+ peeps in our garden after the ceremony. The second and most important celebration is the religious ceremony. My friend Ana Mari chose the Ex-Hacienda de Santa Monica as the site for her religious celebration and reception. 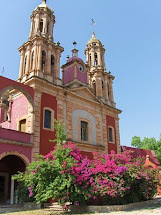 This gorgeous church and hacienda was built in the late 1500s and served as a home and convent during the past 500 years and is now a popular venue for weddings. We arrived a little late to mass and couldn't fit inside the church! 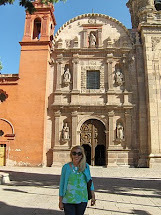 After the mass in the cathedral, we walked around the corner to the entrance of the convent. Amazingly, the majority of the exterior and interior details are the original construction with a few modern updates. As we were greeted by a dozen singing mariachis, we found our table and enjoyed some delicious hibiscus water and hors d’œuvres as the other guests arrived. The interior courtyard of the ex-hacienda looked like a dream. Hanging votives appeared to be floating in mid air. Square and round tables offered a unique floor plan for seating for hundreds of guests. Mexican weddings are big, formal, grand affairs. It’s not at all unusual to attend a wedding with over 500 or even 1,000 guests. The plated dinner consisted of multiple courses that kept getting better and better. We started off with a stuffed chili pepper with cheese bathed in a roasted red pepper salsa. The cream of Brie cheese soup was so delicious that our server actually served a little bit extra to us from the soup tureen. For the main course, guests enjoyed a fork tender filet with a crunchy vegetable topping (maybe beets?) with tiny potatoes and a tomato garnish. It was pure heaven. Wedding cakes are not traditional at Mexican wedding ceremonies. For dessert, I enjoyed vanilla ice cream in a fresh raspberry sauce with hand spun sugar on top. During dinner, we enjoyed a lively band who played rock music. The groom even surprised the bride by singing a song to her. After dinner, a dj played until the wee hours of the morning. This is the fun part! From time to time, party coordinators pass out party favors like hats, beads, sunglasses, and flashing rings to people on the dance floor. I left the party with rings, headbands, beads, and more! The official wedding favor was a pair of monogrammed slippers. Perfect for weary dancing feet. There were plenty of hand rolled cigars for the gentlemen and traditional Mexican candy for everyone, too! The Badgley Mischka dress made her debut at the wedding! What a fantastic celebration and you look beautiful, Bethany! Lovely! Ecuador (where my mother is from) has two weddings as well! How interesting!!!! You remind me of Amy Adams in that picture! The color of your dress is stunning! I am not very familiar with the tradition of having two weddings, do you know what the purpose is? Jennifer ~ Thanks! Someone else told me exactly the same thing...that I looked like Amy Adams. I love her! Baltimore Prep ~ The religious ceremony has no legal validity in Mexico, so the civil ceremony performed by a judge is what makes a couple legally married in the eyes of the government. Priests, rabbis, etc... have no legal authority to marry people in Mexico. Wow, it looks like a beautiful wedding - and you look beautiful as well!